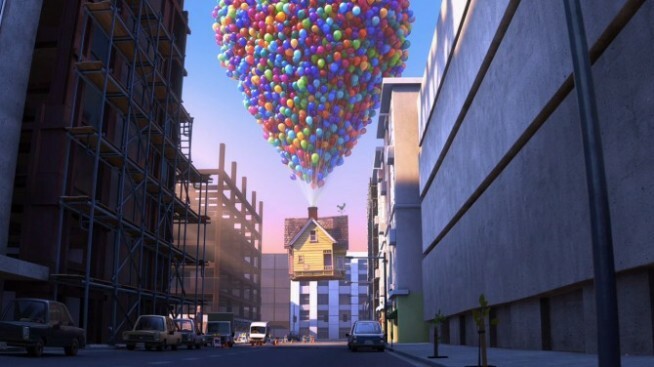 The house at the center of Pixar's "Up" has been replicated and is being sold in Utah. Out of all of Pixar's mega hits, "Up" seemed to strike a deep chord with both adults and children alike. For one, it might have had the sweetest story of any Pixar movie and it by far had one of the most emotional scenes of any of the company's flicks. The film by the Emeryville-based studio tells the story of an elderly man who strikes up an unlikely relationship with a young scout after his wife passes away. But for those "Up" fans who like to blur reality and bring digital animation to real life, they can now live in a real life replica of the house from the movie. The only problem is the house is located in Utah and nowhere near the Fenton's on Oakland's Piedmont Avenue, as shown in the movie. Utah-based home builder Bangerter Homes just finished building a four-bedroom, 2,800-square-foot replica of the home with the exact colors any interior details as well, including replica furniture as well. As close as the house may look to the real thing, it is not an exact replica because the builder says there was no blueprint available for them to follow. The house was built with the full permission of Disney, Pixar's parent company, with the condition that the builder turn over the plans for the house once it was built. The house can be yours for $399,000.